Home / The HTA Blog / What’s Wrong with this Process? 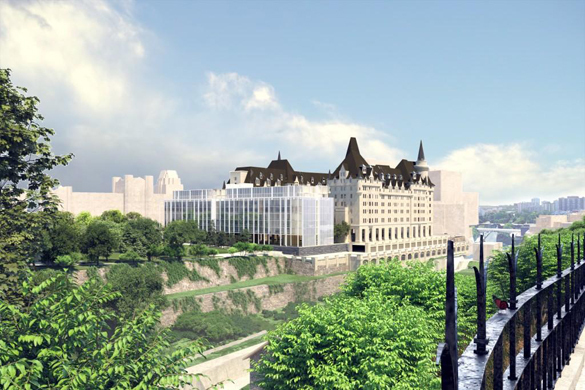 Wednesday night was the City of Ottawa’s Open House on the latest proposal for an addition to the Château Laurier. It was a strange event. I could write about the applicant’s failure to demonstrate that the design is deferential to the historic fabric (despite using the word multiple times), the misleading architectural renderings on display, or the rambling and historically illiterate effort to invoke the picturesque and John Nash. And I may do so in future blogs. But what I want to address right now is the process itself. This was supposed to be an opportunity for the public to gather information about the proposal, presumably so that we can forge informed opinions about it. After all, our City Councillors will ultimately vote on this, and if we want them to speak for us we need to know what we want them to say. Now, if you want to make an informed decision about something, you would want as much information about it as possible, right? You’d want to see it from a range of perspectives, gather a variety of informed opinion, and decide where you stand on the spectrum of views expressed. Alas, that spectrum was pretty tiny on Wednesday night. What this really amounted to was a city-sponsored opportunity for the applicants to present their proposal in the best possible light, without any opportunity for rebuttal or refutation. If this were a trial, the public audience would be the jury – and only the lawyers for the defence were allowed to speak. ‘Not true!’, some will protest. ‘Time was set aside afterward for the public to interact one-on-one with the applicant, and give their feedback.’ But what good is that? To continue the legal analogy, it would be like a judge saying, ‘the defence will present its evidence, the prosecution will remain silent, then the jury members will have a chance to discuss the case one-on-one with the defence team before adjourning to reach a verdict.’ All that was needed was an open, public question period. A chance for everyone to challenge the claims made by the applicants, and for everyone to hear their answers. But that’s not what we got, which raises fears that Wednesday night’s event was simply one more box ticked off on the road to rubber-stamping this proposal. This is a very sensitive situation as the Chateau Laurier remains an icon and an identifier for Ottawa. The second iteration of the project looks slightly better than the first abomination, but, as you say, we are not there yet. No originality, no respect for the building in place and its style, only a senseless aping of today’s fad of glass and more glass, which in any case is totally unsuitable for the local climate. The architects are not up to the task. We need to find a firm of talented architects. Couldn’t agree with you more! Thanks for this!